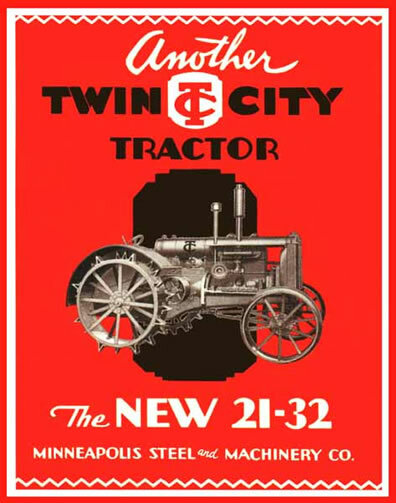 Minneapolis Steel & Machinery Company was very cautious with a lengthy development of the Twin City 21-32 that dates back to 1925. The cross flow, sixteen valve head used since 1918 would be discontinued. Cylinder head technology had advanced considerably with better flowing two valve chambers that cost less to manufacture. A 381 cubic inch engine with a bore and stroke of 4 ½ x 6 was being designed and tested in 1925 using a 12-20 chassis. The new engine bearing FE part numbers had the cylinders and heads cast in pairs so that removal of one head and one cylinder block at a time was possible. 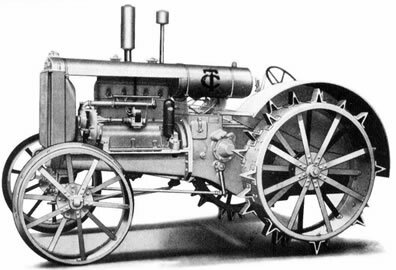 Between 1926 and 1928, 302 copies of the first production 21-32 tractors were made with the FE engine running at 1,000 rpm. Using two forward gears, these machines looked very similar to the 17-28, but several castings were different and had FT chassis part numbers on them. Intake duties were handled by a Zenith U-6 and a dry type Bennett air cleaner. 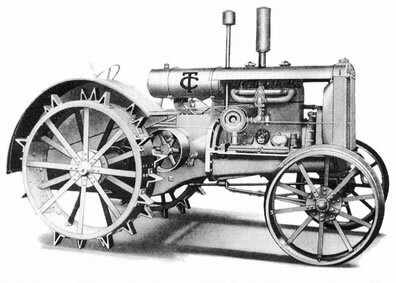 Nebraska Test number 127 displayed 31 drawbar horsepower and 36 belt horsepower from tractor number 150026 in October 1926. In 1928 six experimental units numbered X1 - X6 were produced with a heavier final drive that was in possession of three forward gears. Test number 152 recorded 30 drawbar and 39 belt horsepower from tractor number X- 4 equipped with a Stromberg M-3 and dry type Donaldson air cleaner. Engine rpm was bumped to 1,075 and Bosch supplied ignition magnetos. Persistent economical hardships forced many manufacturing bases to merge or close their doors at the end of the 1920's decade. 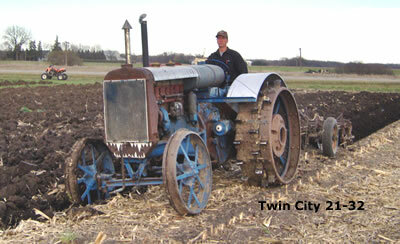 In an effort to survive, MS&MC joined forces with Moline Plow Co. and Minneapolis Threshing Machine Co. in 1929. The newly formed Minneapolis Moline Power Implement Company could now offer a full line of tillage tools, threshing machines and tractors. 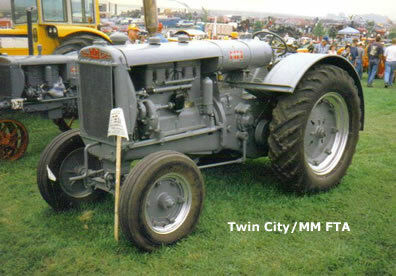 Production of the well established Twin City tractors would continue under the guidance of MM. For 1929 the 21-32 FT, with three speed transmission, was in regular production through 1934. In 1935 the bore was increased to 4 5/8 bumping cubic inches to 403. Now known as an FTA, heavy cast rear wheels rimmed with pneumatic tires were offered. Intake upgrades included a Schebler TTX-16 carburetor and Donaldson oil bath air cleaner. Bore and compression increases pushed power levels to 33 drawbar and 41 belt horsepower for FTA number 155297 in test number 270 of 1936. Addition of wheel weights could easily bring total weight near 8,000 lbs making this rugged four plow tractor capable of handling very heavy loads. 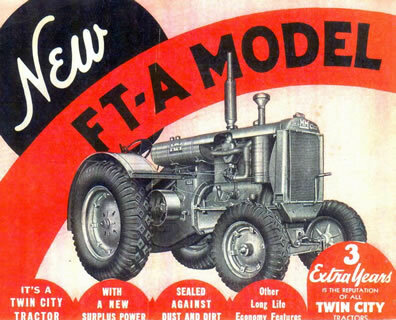 Minneapolis Moline continued production of the FTA through 1938. Most of these post merger late models have MM-Twin City cast into the top radiator tank. Twin City 21-32, FT, FTA, 1926 - 1938. See serial number index for each model.